There's a lot going on right now, and I have a bunch of blog posts planned for going over behind-the-scenes stuff in publishing, the differences between indie and traditional, the editing process, etc, etc, etc. But I'm in a bit of a thoughtful mood today, so I wanted to share something with all of you who follow this blog and write and have your own dreams. But two very stark truths are becoming clear to me in the aftermath, and I hope they will encourage you to keep going, whenever you're getting discouraged in your pursuit of whatever it is that you're aiming for. Firstly, I am the very same writer I was a few days ago. The only thing that has changed is other people's perceptions of me. And that extends to my book, too. I can't tell you how many people I heard from yesterday, telling me they'd read and loved Breakable...yet they never told me that before. So were they lying? Or just motivated now? Who knows. The point is, I am no more or no less than I was a few days ago - I am just viewed differently. It's pointless to get caught up in that. I might fall flat on my face. I have once before. So...? So, nothing. Keep going. Keep living. See what God brings. It's that simple. No need to get full of myself. No need to get down on myself. Just a need to keep going. Secondly, the book that got me this deal was good, but not quite good enough. It's the book that got queried dozens of times and rejected (or ignored) just as many. It got an agent, then got requested -- and quickly rejected -- by 13 editors in major publishing houses. It got self-published, but didn't make enough money to make a living. It garnered great reviews, but no substantial (paid) sales. It's the book that didn't "get there", until it did. What I'm trying to say is, your stuff doesn't have to be perfect to catch the eye of someone who can do something about getting it out there. It just has to be good. And your marketing doesn't have to be expensive, and glossy. In fact, in my case, there was no marketing at all when my editor stumbled across Breakable. I've got an amazing team at Alloy/Amazon, but I can't tell you how many times I've heard the word "dumb luck" or "happy accidents" out of their mouths when it comes to talking about book sales and popularity. There are zero guarantees in this industry. (Unless you count the guarantee that someone will hate it/criticize you/reject you or your book at some point). So, if you haven't gotten where you want to be yet, that doesn't mean you're failing. It just means...you aren't there yet. Keep working. Keep improving. Keep going. Take it from me: I've been actively trying to get a publishing deal since 2009. In fact, my deal offer came just one month shy of the five year anniversary of me first trying to write for publication. I can remember reading notes from authors back then about the time it might take, and not to give up. I always hoped I'd be the exception. Turns out, I'm the rule. ANNOUNCEMENT TIME! *Confetti* Wherein Breakable has been acquired by Alloy Entertainment - and the new version is out TODAY!!! You guys! It’s happening! It’s finally here! I can finally tell you EVERYTHING!!!! Buy it for your Kindle, here. It's slimmer, richer and 100% better than the original, in my opinion. Same premise and basic plot, same characters - but a lot of new content and a completely new delivery of the ending. I’m so excited because this story, which has always been so close to my heart, has finally found a home -- a home with people who are mind-blowingly talented, passionate about my characters and story, and so much fun to work with that I’m keep waking up and pinching myself to make sure it’s all real. Alloy are a subsidiary of Warner Brothers, they've published over 75 NYT bestsellers, and they're the company behind Gossip Girl, Vampire Diaries, and Pretty Little Liars (just to name a few!) In fact, my incredible editor edited the books behind all those shows. The people I’ve had a chance to work with are SO talented, it blows my mind pretty much every time they open their mouths. This habit of picking up independently published books and re-vamping and re-releasing is a new venture for them, so it’s exciting on two levels because Alloy aren’t just re-releasing my book today, they’re also putting out two other formerly independently published YA books! (You should totally check out Heather Hildenbrand's Imitation, and Tracy Banghart's Rebel Wing). The last few months have been a whirlwind. It’s still surreal to me. But don’t worry, I’m going to share. I’ll spend the next few weeks taking you through the fun things that have happened, the things I’ve learned about the publishing industry, and all about the writing journey. But for today I just want to celebrate a dream come true. So even if you aren’t buying books today, please join me in a super-big dance party. Because I can attest to the fact that even in these days and times, real dreams – the ones you’ve worked really hard for – really do come true. More from me when I’ve floated down off cloud nine. Until then, check out the new Amazon page, the Goodreads page, and all the lovely new friends I’ve been making as we go through this process of turning from indie to traditional together, here, and here. 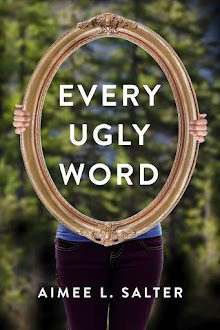 Your Turn: Share the news via the rafflecopter below, and go into the draw to win a $25 Amazon Gift Voucher or a copy of Every Ugly Word! Okay, so I can’t actually TELL you what’s happening until tomorrow, but I can say this: Prepare to dance with me, please. And have your finger primed for the 1-click button. But that’s toeing the line, so I’m leaving now before I start vomiting information. Your Turn: Tell me a joke. Or link me to something. Or…something. Distract me! Please! I’ll put my hand up and recognize the following is NOT a ‘necessity’ to any manuscript. But I’ve spoken with and read articles from several authors who consider it so. Create a scene in the first third of your book which reflects (to a lesser degree) the worst-case-scenario events of your climax. In that first scene, let the protagonist lose or fail. It’s simple foreshadowing, giving the reader a taste of the fearful events at the end of the book with the added tension of seeing the protagonist fail. Hence, when the be-all-end-all events of the climax are approaching the reader is frightened – we can see the worst-case-scenario possibilities. Then, when those circumstances are upon us, we can’t help being scared spitless that the protagonist will lose again. This technique creates symmetry, builds tension and is a great way to establish a plausible foundation for your ending. In fantasy: The Princess tells her aged father she’s become aware of a plot to overthrow him. The neighboring king – a vicious dictator – is trying to seduce the people with promises of wealth and power. She asks for her father’s permission to take the crown and lead the people against the villain. But her father says to prove her abilities, she has to fight his strongest Knight. She is quickly bested and the father laughs her out of the throne-room, declaring her mad and his eldest son to be the official heir. At the end of the book, after her brother’s hedonistic and disastrous rule is brought to a bloody end by the neighboring ruler, Princess leads her people to victory against his hordes - after using the Knight who bested her to train the people to fight. In romance: Hero and Heroine are colleagues – she’s been in love with him for a year. After a particularly bonding late-night strategy meeting, Hero pulls heroine aside to ‘talk about something’. Heroine hopes he’s going to declare his undying love. But it turns out he wants advice on how to get her friend to go out with him instead. At the end of the book, following 200 pages of excruciating tension building, he’ll pull her aside again – but this time he’ll actually declare his love for her. The trick is to foreshadow (imply or hint at what could go terribly wrong) rather than project (tell the reader what you want them to see coming). What's projecting look like? Well, it's the moment when the soldier heroine first meets the villain and says to herself, "This looks like a man who would eat me alive. I hope I never have to face him one on one!" Or it could be a conversation between hero and heroine at the beginning of a romance in which the hero admits "I have this terrible habit of falling in love with someone, then getting cold feet and backing out at the last minute..." (Hint: That's actually a great tension builder to imply - by having the hero recount a past relationship, or having the heroine observe the hero in a relationship doing that very thing...but him talking about it? Waaaaaaay too obvious). Essentially, projecting is leading the reader by the nose. It isn't necessary, and a savvy reader will roll their eyes and move onto something else. I’ll say again: A writer could argue whether the plot mirror falls within the ‘critical’ elements of plot… but I know many bestselling writers believe it is so. And many publishing professionals look for it when they’re reading. Whether you actually paint a plot-mirror-picture or not, make sure that your foreshadowing is subtle. It will serve you well in the end when your readers walk away satisfied. Next Post: The Three Act Structure – and how to signal the end of your beginning. Your Turn: Feel free to ask questions in the comments if any of this is unclear. I’m happy to clarify. From the Archives: "Telling" is Another Word for "Let Me Explain"
I've been having trouble with spam-robot-clicker-commenters on my blog, so am deleting and reposting some of the older, popular content they seem to have connected to. Unpublished writers often haven't learned to trust the reader's ability to gather what's going on. Even the very good ones often show the plot, character development, emotion, etc, then proceed to tell the reader how to interpret it. "Come with me," Carl said, so quietly I wondered if I'd imagined it. He leaned closer, lips at my ear. "Come with me." His fingers closed on my arm, as if he could force me. Drag me along. "I can't." It came out broken, betraying my desire to follow. I never wanted to let him go. "No, Carl, you don't understand!" I stepped back, out of his hands, away from his lips. "They killed my mother. If they find out we're together, they'll kill you too." My voice shook, but I couldn't make it stronger. I was too afraid. Too desperate for him to find another answer that would let us stay together. Carl eye's narrowed. "I can take care of myself. And you," he said, seemingly willing to dismiss my mother's death. "Come with me," Carl said, so quietly I wondered if I'd imagined it. He leaned closer, lips at my ear. "Come with me." His fingers closed on my arm. "I can't." It came out broken. "No, Carl, you don't understand!" I stepped back, out of his hands, away from his lips. "They killed my mother. If they find out we're together, they'll kill you too." My voice shook, but I couldn't make it stronger. Carl eye's narrowed. "I can take care of myself. And you," he said. 1. Using the words "as if". 2. Use the word(s) "seemed / seemingly / seems to". 3. Using the name of an emotion. If you're using any of these in the process of describing the POV character's interpretation of another character, you might be telling the reader what to see. Now, obviously there are several situations in which these phrases or words can be used legitimately, but keep the above examples in mind. Train your eye to look for explanation, then delete it wherever possible. And here's more food for thought: If you remove statements like those bolded above and the reader can't interpret what's going on, the problem is in your showing. Don't fall into the trap of explaining. Figure out how to make it clear in the action or dialogue, not author narration. Your Turn: Are there any other words or phrases you think writers could search their manuscripts for to identify "telling"? The 29th is a Tuesday. And if you’ve been listening to some of the publishing bigwigs online for a while, you’ll know that there’s something that often – some would say “usually” – happens on a Tuesday. Your Turn: What often/usually happens on the Tuesday in the publishing world? Okay, guys, I know I’ve been completely letting the team down in terms of blogging this year. I promise, in a few days you’ll understand why, AND you’ll see that there’s going to be lots of new, fun, and chock-full-of- info posts coming over the next few weeks and months. So, until then, keep an eye on my Twitter and Facebook feeds for clues. And please accept my apologies for disappearing. It won’t happen again. Your Turn: What have I missed in YOUR life since April? Or, tell me what you think I’m going to say next week? That's right, I've being hosted as the author over at Dear Teen Me. This is such a special moment for me because that was the website that inspired Breakable. But also, I just plain love what they do over there. Hi guys, I know I have been seriously AWOL this year, and I owe you lots of new content. But fear not! It cometh! See you on the other side - a lot more often! Ha!